Easter is a day that is honored by nearly all of contemporary Christianity and is currently being used to celebrate the resurrection of Jesus Christ. Is it truly the day when Jesus arose from the dead? Where did all of the strange customs come from, which have nothing to do with the resurrection of our Saviour? Why the Easter bunny? Why the Easter eggs? 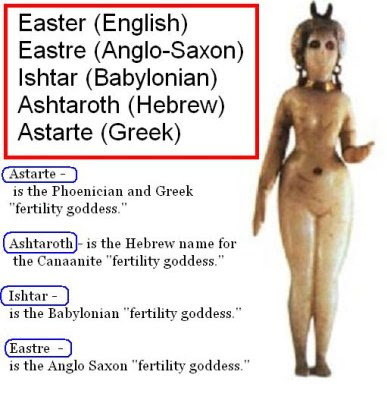 "Ishtar", which is pronounced "Easter" was a day that commemorated the resurrection of one of the Babylonian gods called, "Tammuz", who was believed to be the only begotten son of the moon-goddess and the sun-god. The Easter tradition originates from ancient Nimrod, who was the grandson of one of Noah's sons, Ham. Ham had a son named Cush who married a woman named Semiramis. Cush and Semiramis then had a son named "Nimrod." After the death of his father, Cush, Nimrod married his own mother, Semiramis, and became a powerful King. "And Cush begat Nimrod: he began to be a mighty one in the earth. He was a mighty hunter before the Lord: wherefore it is said, even as Nimrod the mighty hunter before the Lord. And the beginning of his kingdom was Babel, and Erech, and Accad,and Calneh, in the land of Shinar." Nimrod is the one that lead the people to build the tower of Babylon. The Book of Jasher (mentioned in the Old Testament) tells the story that Nimrod wore the garments that God made for Adam and Eve. These garments gave him supernatural power so that he became known as a "god-man" to the people. Semiramis, his wife and mother, became the powerful Queen of ancient Babylon. Nimrod was eventually killed by his enemy, Esau. Nimrod's body was cut in pieces and sent to various parts of the kingdom. Semiramis had all of the parts gathered, except for one part that could not be found. That missing part was his reproductive organ. Semiramis claimed that Nimrod could not come back to life without it and told the people of Babylon that Nimrod had ascended to the sun and was now to be called "Baal", the sun god. Queen Semiramis also proclaimed that Baal would be present on earth in the form of a flame, whether candle or lamp, when used in worship. Semiramis also set herself up as a goddess, claiming that she was immaculately conceived. She taught that the moon was a goddess that went through a 28 day cycle and ovulated when full. She further claimed that she came down from the moon in a giant moon egg that fell into the Euphrates River. This was to have happened at the time of the first full moon after the spring equinox. Semiramis became known as "Ishtar" which is pronounced "Easter", and her moon egg became known as "Ishtar's" egg." Ishtar soon became pregnant and claimed that it was the rays of the sun-god Baal that caused her to conceive. The son that she brought forth was named Tammuz. Ishtar, who was now worshipped as the "Mother of God and Queen of Heaven", continued to build her mystery religion. The queen told the worshippers that when Tammuz was killed by the wild pig, some of his blood fell on the stump of an evergreen tree, and the stump grew into a full new tree overnight. This made the evergreen tree sacred by the blood of Tammuz. She also proclaimed a forty day period of time of sorrow each year prior to the anniversary of the death of Tammuz. During this time, no meat was to be eaten. Worshippers were to meditate upon the sacred mysteries of Baal and Tammuz, and to make the sign of the "T" in front of their hearts as they worshipped. They also ate sacred cakes with the marking of a "T" or cross on the top. Every year, on the first Sunday after the first full moon after the spring equinox, a celebration was made. It was Ishtar's Sunday and was celebrated with rabbits and eggs. Ezekiel 8:14 14 Then he brought me to the entrance to the north gate of the house of the LORD, and I saw women sitting there, mourning for Tammuz. 15 He said to me, "Do you see this, son of man? You will see things that are even more detestable than this." The truth is that Easter has nothing whatsoever to do with the resurrection of our Lord Jesus Christ and is "detestable" in the eyes of Lord. It is because Acts, chapter 12, tells us that it was the evil King Herod, who was planning to celebrate Easter, and not the followers of Yeshua. Excellent report! One detail to look into is the "enemy" of Nimrod was most likely Shem, not Esau as the text indicates. Keep working to restore the Truth, so the scattered ones will return to the Covenant. but keep in mind the jewish religion is borrowed from the egyptian hitites n babylonians. its all myth...n the jews got the bloodiest, dumbbest part of the myth..the sick n deplorable old testament. there was no abraham n there was no moses...they are made up u fools. Abraham's ancestors decorated eggs and place them in the graves of their dead as a symbol of life after death. Hi there! This post couldn't be written much better! Looking at this article reminds me of my previous roommate! He continually kept preaching about this. I am going to forward this article to him. Pretty sure he's going to have a very good read. the other hand I'll surely come again again. It is also my understanding that eggs were dyed with the blood of the children that were sacrificed to the goddess Ishtar.... I appreciate this post... Thank you! Your stuff is good, but please please will you read WALK IN THE LIGHT by TODD BENNETT to get the Names of our Father and Messiah correct and know that we cannot call Him Lord or God any longer.